Hello all! I just wanted to share this photo that I found yesterday on Jody Watley's wall on Facebook. 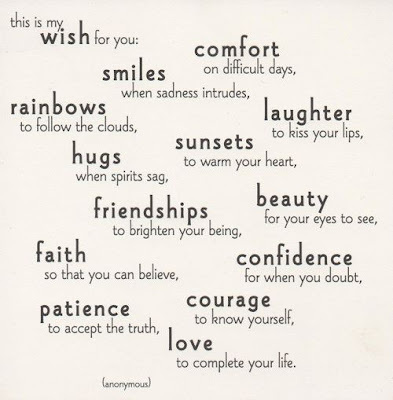 She posted it and invited others to share it, so I am :-) I thought that it was great and so I wanted to post it here. So much negativity is out there everyday, so it's nice to share something good! Therefore, please feel free to share this if you like! Hello again! I wanted to complete my Askeys/Silver Spoon products posts today and to share what I made. You can read my first post about the other products here. Instead of doing two more posts, I’ve decided to put the remainder of the products into this one post since they were all used together. As I mentioned last time, the people at Silver Spoon, the makers of the Askeys products, sent me some different items to try out. I received the above items and I put them all to use to make some ice cream sundaes for us. I had fun with this because I can’t remember the last time I had an ice cream sundae. Brit Boy and I had fun building the sundaes together. We got very whimsical with this one and I call it ‘The Windmill’ ;-) It was built using a base of vanilla ice cream and then we drizzled the Askeys Butterscotch dessert sauce onto it. Next, we sprinkled the sundae with some of the Silver Spoon Create Duo Chocolate Hearts. 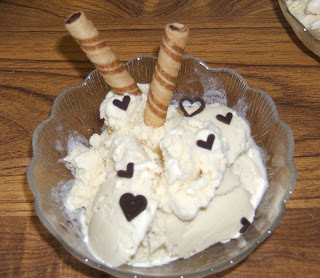 Lastly, we accented the sundae with two Askeys Ice Cream Wafers and voila...we have our windmill. This sundae was beautifully understated and tasted delicious! 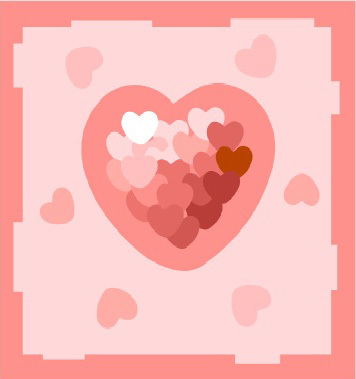 The chocolate hearts were a tasty dark chocolate and the butterscotch sauce had a nice toffee flavor to it. Our decorative windmill blades were light and tasty too...they were fun to dunk into the sundae. The other sundae had the same vanilla ice cream base and sported the chocolate hearts once more, but this time, we tried it without the butterscotch sauce. And we finished it off this time with some Askeys Cafe Curls. The cafe curls are rolled wafers that resemble straws and they have delicious chocolate lining inside of the wafers. This was a delicious sundae too and the cafe curls were an excellent addition. Afterwards I found myself eating a couple of the cafe curls just by themselves...they’re that good! The curls are also good with a cup of hot chocolate too. I will definitely be purchasing more of these. And last but not least, the people at Silver Spoon sent me some Silver Spoon Cakecraft Milk Chocolate Chips. 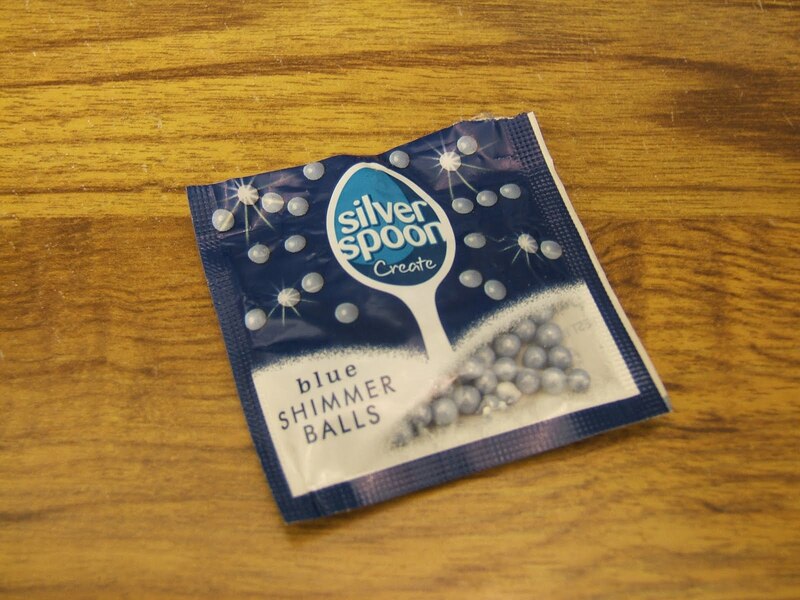 I meant to sprinkle some of these on the sundaes, but alas, I forgot them in all of the ice cream sundae excitement. So I did the only honorable thing that I could do as I sat there revelling in the afterglow of a yummy dessert...I ate a few right out of the pack...for research purposes only ;-) And take it from me, they’re tasty too! I plan on making something with them soon and refraining from eating them right out of the package. Lol. So I have to say, I’ve enjoyed all of the products that the good folks at Silver Spoon sent to me. I don’t bake every day and I don’t have sundaes every day, but whenever I have a treat from time to time, I’ll know where to go for some great products! 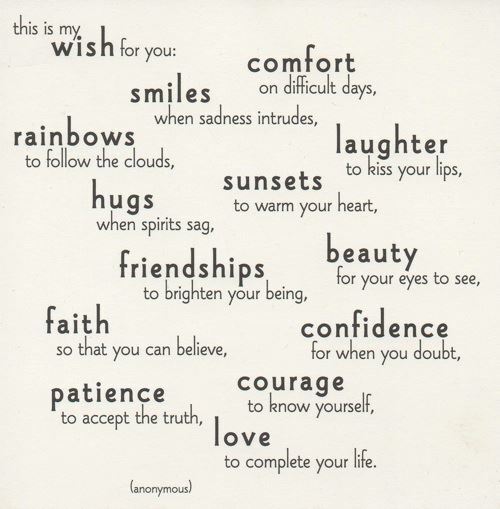 HAPPY VALENTINE'S DAY TO ALL!!!!!!!! 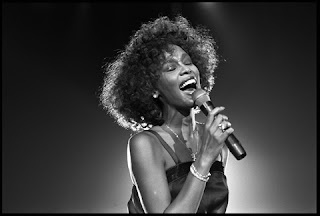 As many of you know, on Saturday we lost Whitney Houston and it really saddens me like it does so many others. Whitney Houston’s voice was an amazing gift that she shared with the world and I celebrate that today. I don’t want to dwell upon the negativity that I’ve read and heard over the weekend about her troubles. I mean, her struggles were well-documented and I just don’t feel the need to go back over that tired old track over and over. What’s the use and why add to the cloud of speculation? As I said, I just want to celebrate her here in my little corner of the internet and share my personal memories of her. 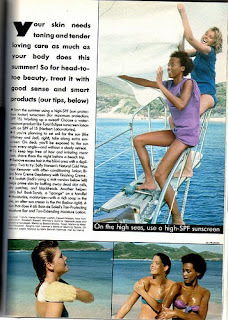 The first time that I saw Whitney Houston was in Seventeen magazine, during the early 1980s. 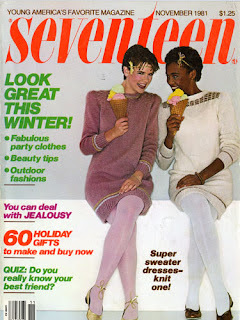 I was an avid reader of the magazine as a teen girl and I remember seeing beautiful Whitney there often. I thought that she was so lovely and I would try to mimic her style from the pages of the magazine. I remember reading a little blurb about her in the magazine and she said that she’d love to be a professional singer one day. And I thought, ‘How cool...isn’t that nice”. Little did I know that this girl that I saw in my Seventeen magazine was such a powerhouse singer! So fast forward to a while later and I’m watching music videos one day and this video comes on the television, “You Give Good Love”. It was the beginning of her amazing catalogue of songs and I was blown away. I remember being so proud of her because here was this girl that I’d seen in Seventeen magazine for so long and now I saw her like this in all her glory. Of course I didn’t know Whitney, but it felt kind of like I was seeing somebody that I knew before they were famous in a way...if that makes any sense. So over the years as she became this great legend, I often thought back to that girl in my Seventeen magazine. 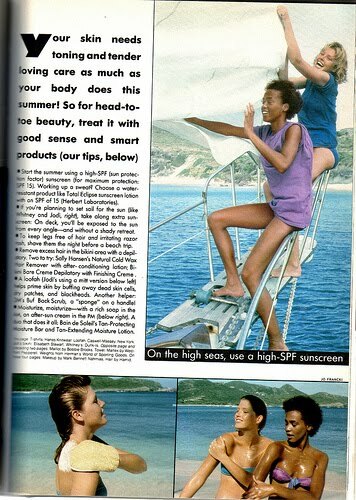 I will always of course remember the incredible singer that she was, but that very young Whitney from the pages of my magazine will always stay with me too! I'm not saying anything new as we all know how amazing her voice was and how beautiful she was...that is common knowledge. But I will say this...I truly thank her for sharing her amazing talent with us while she was here among us. Her voice will last through the ages...what a legacy! Above is a lovely “I Love You” cake that Brit Boy made for me here at the Yellow House. He made the cake and the decoration turned into a collaborative effort. The cake was a devil’s food cake with vanilla icing and it was so yummy! I love baking as you know and it was really fun to collaborate with Brit Boy on this cake. 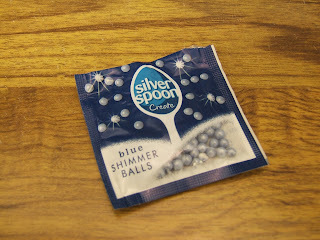 Some of the decorations are courtesy of a great company called Silver Spoon, makers of the Askeys brand products. The good folks there sent me several of their products to try out since I love baking and creative cooking ;-) You may remember my post from back in November, when I was experimenting with the Askeys brandy snap baskets as a substitute for mini pie shells. Check the post out here. I wasn’t familiar with the Askeys brand before I tried their brandy snap baskets, but they make really excellent products that can help you create some tasty desserts. Silver Spoon also makes wafers, cones, topping sauces, sprinkles, and various icings. They boast an impressive range of products in their Cakecraft range for all of the bakers out there. I received a variety of products, so I will be presenting a couple of other posts in the near future, highlighting what we’ve made around the Yellow House when we decide to have a treat again. I look forward to sharing what I’ve come up with as I present the other products. So, back to our cake :-) In order to decorate our cake, we used these blue shimmer balls by Silver Spoon along with some other flowers that we had on hand. 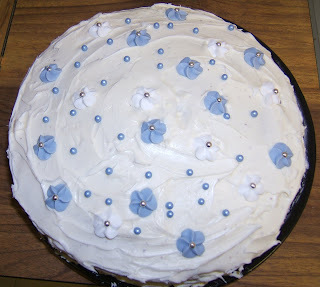 The blue shimmer balls were an excellent accent to the flowers and just made a sweet looking little cake. Also, the decorations actually tasted good, so that was a plus! 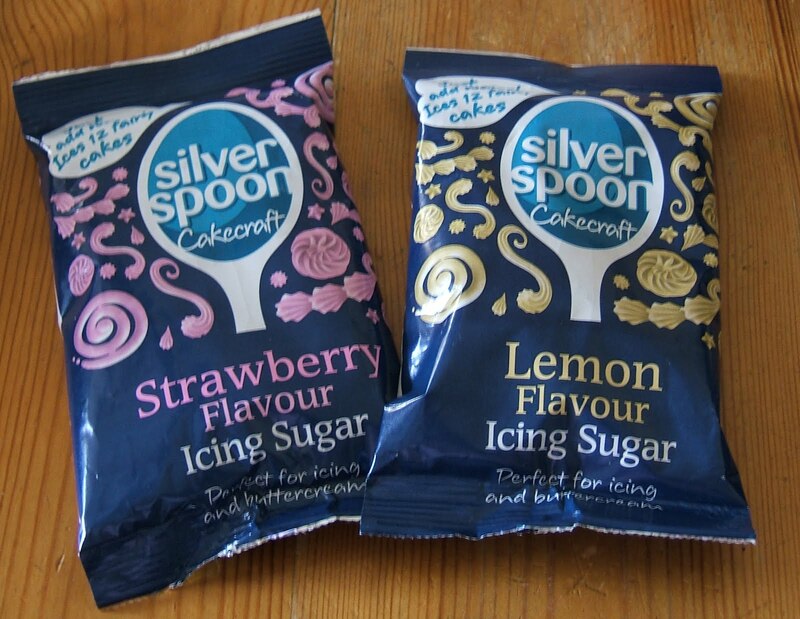 The folks at Silver Spoon also sent along a couple of products from their Cakecraft range. 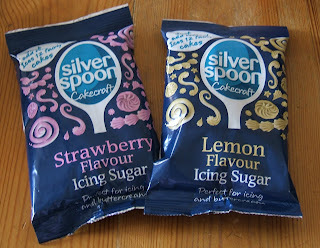 They sent some strawberry and lemon icing sugar that I haven’t tried yet, but I’m sure that they will both get a whirl too. I have to spread out my baking though...we can’t have treats like this too often ;-) But that’s what makes treats like this special...you don’t have them every day. I'm excited that I have two flavors to try since I’ve never tried these before. I look forward to getting creative with these! And that’s my blue food story. Okay...so it was more blue-adorned, but blue just the same ;-) And most importantly, Brit Boy was kind enough to make it for me and that is a wonderful thing!